Three weeks of delving into the literature and available documents related to the interplay between architecture and music at San Marco in the 16th century between the architect Jacopo Sansovino and composer Adrian Willaert helped to give this project the initial impetus required to find a direction to proceed in. After an analysis of the literature, we were able to identify two principal issues that need to be elaborated upon to understand this interplay between music and architecture. The first is to understand how multi-part, complex polyphonic music can be appreciated in large churches which are notorious for their bad acoustics. The second big challenge is to be able to take into account the differences between empty churches as they are generally used today in musical performances and the fully decorated churches which were packed with the people of Venice at the time of festive celebrations. There are two works of special interest and relevance to this project. The first of these is the CAMERA project (Centre for Acoustical and Musical Experiments in Renaissance Architecture) by Laura Moretti  and the second is a thesis carried out by Braxton Boren at the University of Cambridge . In fact, both these works are linked since the data collected from the CAMERA project was actually used for further analysis in Boren’s work. The CAMERA project was aimed at capturing the acoustics of the current architectural ‘versions’ of major churches in Venice by placing sound sources and sensors at important locations within the churches. 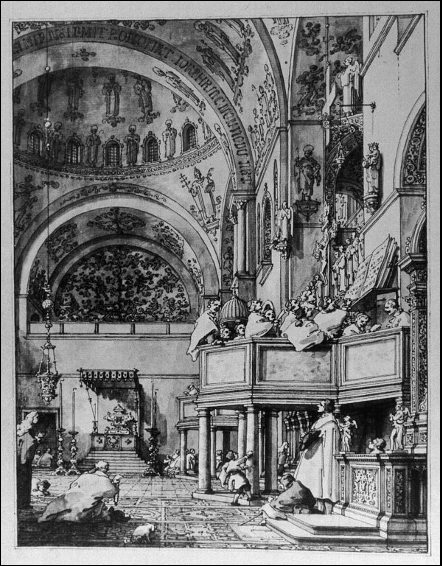 However, this data is unfortunately not enough to fully understand the acoustics inside the churches of the 16th century or earlier because of the difference in architecture then and now – for instance, the arrangements of specific tapestries or festive decorations varies greatly from the current state. This is where the importance of Boren’s work comes to the fore. He used acoustic simulations using a software program called Odeon 10.0 to simulate the sound received at specific points within the church given a sound source. 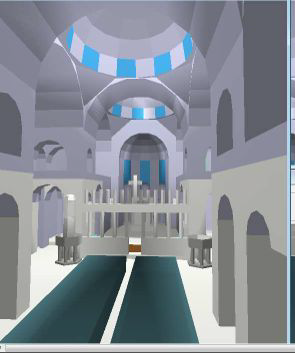 This simulation factored in the sound absorption, reflection, scattering and propagation characteristics within the church architecture and from different surfaces (such as statues, walls, pillars, etc…). This model was first used to validate the data collected by the CAMERA project. Once this was successfully completed, the 3D models representative of the current architecture of the churches were modified to reflect changes in the architecture that took place in the preceding centuries to arrive at the sound quality and characteristics that resulted from that particular layout. At this stage in the project, it would be pertinent to attempt to contact Braxton Boren to discuss and further streamline the goal and approach for the remainder of the project. We would like to ask him whether it would be relevant to construct our own 2D model of San Marco, or whether it would be better to build a 3D model. In case it turns out to be too complicated or time-consuming given the scope of the current project, we plan to consider reusing the results of the CAMERA project as well as Boren’s simulations to try to recreate the sounds at several places within the church in order to have interesting data and perhaps some sound-clips to put on our final timeline.